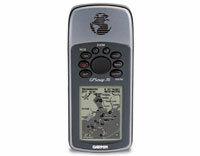 Garmin GPSMAP 76 (010-00249-11) €179.00 - buy online at mysatnav.ie - Ireland's leading GPS & Sat Nav store. The GPSMAP 76 is preloaded with a basemap of principle cities, motorways, roads, rivers and lakes, including marine navigation aids such as lights, buoys, sound signals and day beacons. With the 8MB of internal memory you can load detailed maps from optional MapSource� products, including Garmin Bluechart� marine map data and Mapsource Metroguide� street-level maps for regions such as Europe and North America. If you are looking for contour maps of Ireland it is possible to download freeware contour maps of Ireland from the Scottish Mountaineering Club. To download these maps to your GPSMAP 76, follow the SMC instructions carefully, as any mistakes or data corruption may affect the warranty of your GPS device. You download these contour maps to your GPS device at your own risk.